Brazil nuts are one of the most valued nuts in the world, and only found in the forests of the Amazon. These little gems are packed full of mono-unsaturated fatty acids, Vitamin E, selenium, antioxidants, thiamin, copper and magnesium. High in calories and protein, these nuts are a staple to the Amazonian diet and should be in yours, too! Brazil nuts are one of the most valued nuts in the world, and only found in the forests of the Amazon. The brazil nut trees are some of the tallest trees, and indeed longest living, in the rain forest - spanning 50 metres tall with a lifespan of well over 500 years. These little gems are packed full of mono-unsaturated fatty acids, Vitamin E, selenium, antioxidants, thiamin, copper and magnesium. High in calories and protein, these nuts are a staple to the Amazonian diet and should be in yours, too! • Like this snack? Try our Pine Nuts! Brazil nuts are a staple food in many diets. Grown in South America, they are a natural part of the South American diet and are also enjoyed by vegetarians, vegans and raw foodists. Their rich and creamy flavor makes them a fabulous addition to many different types of dishes from desserts, nut milks to main entrees. Over 90% of the Brazil nuts harvested a year are from Bolivia & Brazil, with Bolivia in the lead, with 50% of the production. High Protein: Brazil nuts are 18% protein. It is also low in carbohydrates that make them very useful for people that are trying to maintain a high protein low sugar diet. The Brazil Nut is great for those maintaining a diabetic friendly diet. It is due not only the high level of protein but also fat. 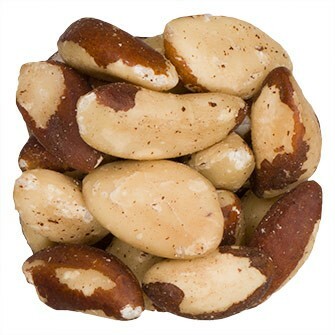 Heart Healthy Fat: Brazil nuts are 69% fat. Most of the calories come from the high level of fat in these nuts. Brazil nuts are full of good monounsaturated fats. These are the fats that the American Heart Association say are good for heart health.The Brazil nut has the highest percentage of saturated fat compared to all other nuts. Selenium Source: Selenium is an essential trace mineral linked to our thyroid and immune function. Being selenium deficient can cause things as seizures, heart disease, rheumatoid arthritis depression, anxiety and asthma. Fortunately, selenium deficiencies are not common in the Western part of the world. 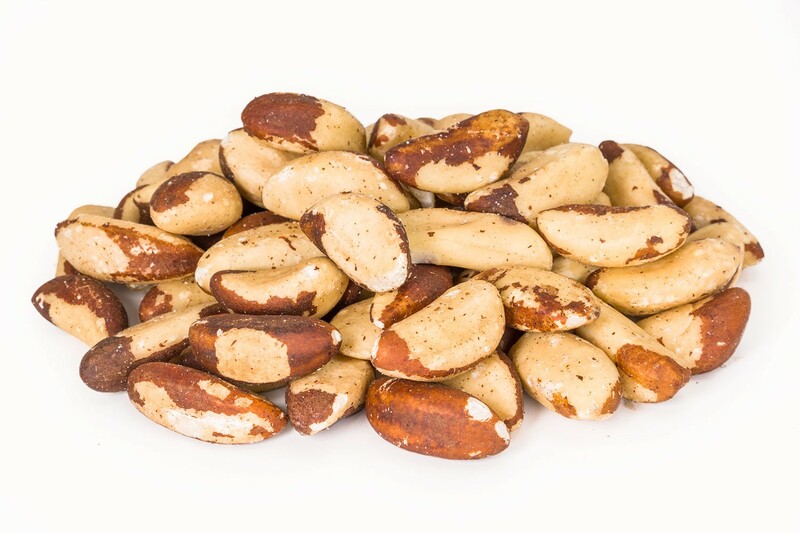 It only takes one ounce of Brazil nuts to satisfy over 750% of the daily recommended value. Essentially, if you eat one of these nuts a day you will have gotten the selenium you need for the day. Brazil nuts offer other nutritional benefits such as magnesium for muscles and copper for bones, connective tissues and thyroid function as well as manganese, zinc, vitamin E, potassium, and riboflavin. These nuts also support the production of melanin that protects and repairs tissues. Brazil nuts are a larger nut, so it only takes 6 of them equal a one ounce serving. 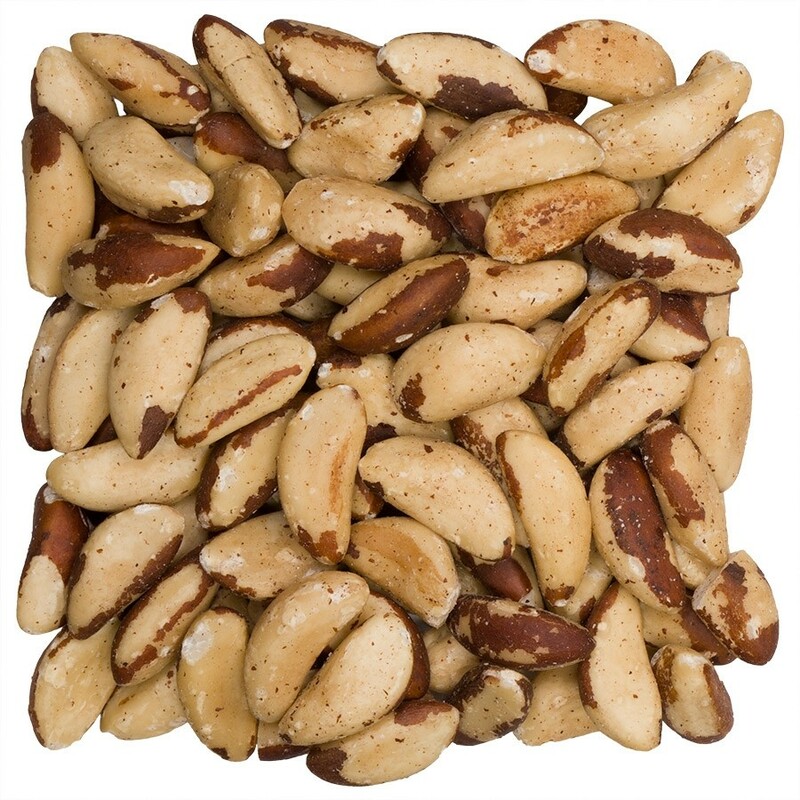 One ounce of Brazil nuts contains about 185 calories, 4 grams of protein, 3 carbs and 2 grams of fiber. 91% of all the calories come from fat. Over consumption of the Brazil Nut can cause some unfavorable side effects. In excess selenium can have some negative impacts such as brittle hair and fingernails, skin rashes, fatigue and disruption to the digestive system. You can use Brazil Nuts in their raw form or when cooking. The nuts themselves have a large size to them, which makes them ideal to use on larger cakes, however, when the Brazil nut is when roughly grounded it is easy to use in so many other dishes. You can use them on the inside of your cakes, or as a topping. They are also a great addition to bring a crunchy texture into rice or vegetarian dish. The Brazil Nut goes excellent with chocolate, inside a smoothie, as a texturized or flavor enhancer of a main entree, or even brazil nut milk as a dairy substitute.